Many men about to become fathers want to build a relationship with their own child that is deeper and more fulfilling than what they experienced with their own fathers. With more mothers working outside the home than ever before, it has actually become necessary that fathers do things differently today. They cannot easily fall back on their own childhood experiences for guidance. So where are the role models for these new fathers? How will they define their role? There are no easy answers, but for a well-written article on defining father’s role, see Pioneer Thinking‘s website. Complicating the question of father’s role is the expectation that baby will actually want to spend time with Dad, when in fact the vast majority of new babies want nothing more than constant and reassuring physical contact with their mothers, and only their mothers. Most men have thought about their new role, and are ready to step into it, but baby doesn’t seem particularly interested. There are some very good reasons for this. Newborn babies do an astonishing thing in their first month of life: many of them increase their weight by as much as 25%. For a 200-lb man that would mean packing on 50 lbs, at a rate of 1-1/2 lbs per day! To accomplish this amazing feat newborn babies have to nurse a lot – about every two hours, ’round the clock. Some babies have nursing sessions as short as 10 minutes, but most babies nurse for about 20 minutes each time they’re at the breast. 4 hours a day at mother’s breast. Luckily this is exactly where most newborn babies want to be. Obviously fathers can’t breastfeed – that is a uniquely feminine function. So what’s left for a new father to do? First of all, you can take care of your partner, so that she can take care of your baby. In the first few weeks after the birth Mom is recovering from the sheer physical exertion of giving birth. She is also adjusting to the huge changes her body is making now that it is no longer pregnant. Waking up at night to nurse baby can leave her exhausted and depleted. Becoming a mother is a major life adjustment, so there are also huge emotional changes occurring. Your baby’s need to be with his mother can seem constant and never-ending, and can feel overwhelming for your partner. There’s lots you can do with baby, too. Mother’s breastmilk is essential for your new baby to grow and thrive, but baby will also have other, very human needs: to be held and carried, talked and sung to, rocked and snuggled, as well as the more infantile needs of being bathed and diapered and helped into sleep. Fathers can do all of these things with their baby. And most mothers will gladly hand over baby to Dad after an long day of nursing and changing diapers. Even the most loving and dedicated mother can get ‘touched out’ caring for a new baby. Her body was ‘occupied’ for nine months to grow a baby. She is no longer pregnant, but now her body is providing milk to baby. Most mothers do not begrudge giving to their babies, but having some ‘this-is-my-body’ time can still be pivotal for keeping Mom’s sanity. baby gets some ‘Dad’ time. You don’t have to do anything amazing with your baby…if he/she is ready, you can just have a nice snooze together. Bathing together can also be very enjoyable for both of you. Wet, wriggly babies are very slippery, though, so arrange to have someone else (Mom?) take baby from you when it’s time to get out of the tub. Not all babies will be happy leaving Mom for Dad. If your baby seems unhappy with you, try not to take it as a personal rejection. At his birth he had to leave the comfort and safety of his mother’s uterus for the big, scary outside world. It’s understandable that he wants to remain in her familiar presence as much as possible. Many dads get most of their weekday ‘baby-time’ in the evenings. Unfortunately baby is often quite fussy and irritable then. Just like you, he gets tired and overstimulated from the activities of the day. And he expresses it the only way he knows how – by crying and fussing. It can be quite stressful holding a crying baby, especially when you can’t put him to the breast to soothe him. But by providing a calm, quiet environment and rocking and singing to your baby, you can sometimes soothe him. 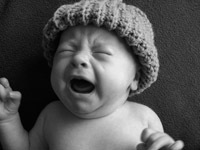 See Parenthood.com for more tips on how to soothe your fussy baby. At times, despite your best fathering efforts, you may have to give your baby back to mom, because in the evenings he will probably want to nurse more often. It’s a way of comforting himself. Again, don’t take it personally…your baby knows what his needs are, and he can be very direct about expressing them. The challenge of being a new parent is figuring out what they are! Some babies are ‘colicky’ – they have bouts of inconsolable crying that go on for hours, and they appear to be in pain at the time. This can be one of the biggest challenges of caring for a new baby. For tips and coping strategies see Dr. Sears’ website. It requires patience to father a new baby, but the rewards are there…in time your child will go willingly and joyfully into Daddy’s arms, and you will start to feel comfortable and confident in your role as father! If you are a Dad that works outside the home, you may feel conflicted leaving Mom and baby at home while you’re at work. Obviously it is now really important that they make an income for your family, but you also want to be home with Mom and baby. Everything feels like a priority. Through this period, try to keep your sense of humour, be forgiving of yourselves, live one day at a time, and enjoy your baby and each other as much as you can through all the change, fatigue and confusion. At some point you will lift your head out of the parenting fog you’ve been in since the birth and realize that you and your new family are all doing fine!